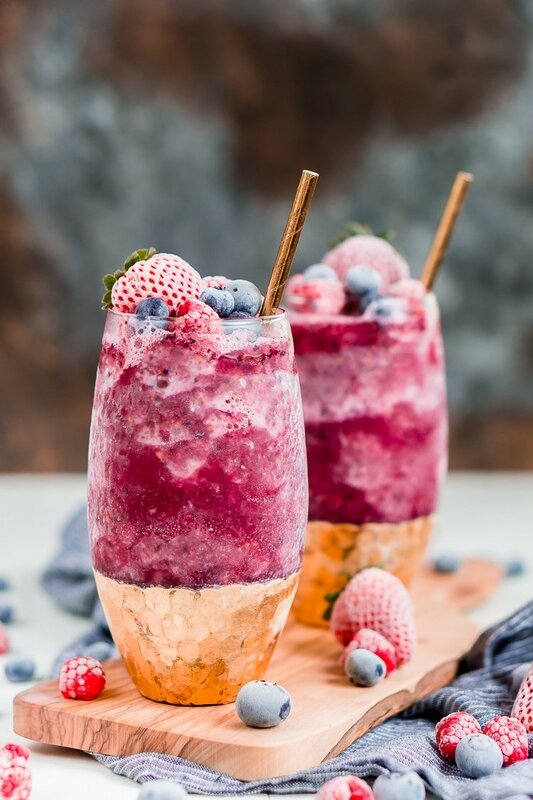 Sangria Slushies are loaded with berry and citrus flavors and Red Moscato making it the perfect frozen cocktail for summer! When I was in college I was a Tastefully Simple consultant and the product I sold the most of was the Sangria Slushies. They were so good! Since then, I’ve found a way to make this delicious frozen cocktail right at home! Now, I’m not a huge wine drinker, but I absolutely enjoy Moscato and Rosé and I really love sangria be it white or red or even a hard cider sangria. 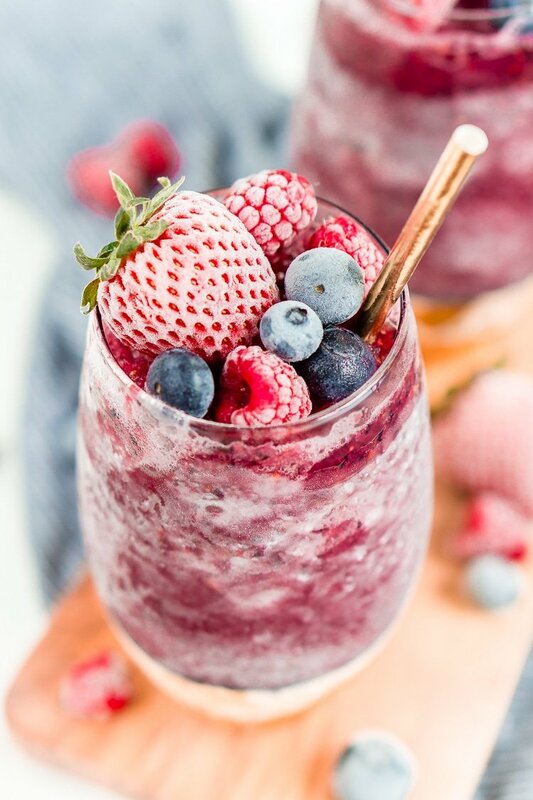 And I feel like taking sangria and making it a frozen slushie is pretty much the ultimate summer cocktail! They’re like grown-up slush puppies! This sangria, in particular, will be a hit with anyone who loves the berries of summer and a touch of citrus. I made these for Mother’s Day brunch and everyone loved the mix of sweet and tart! 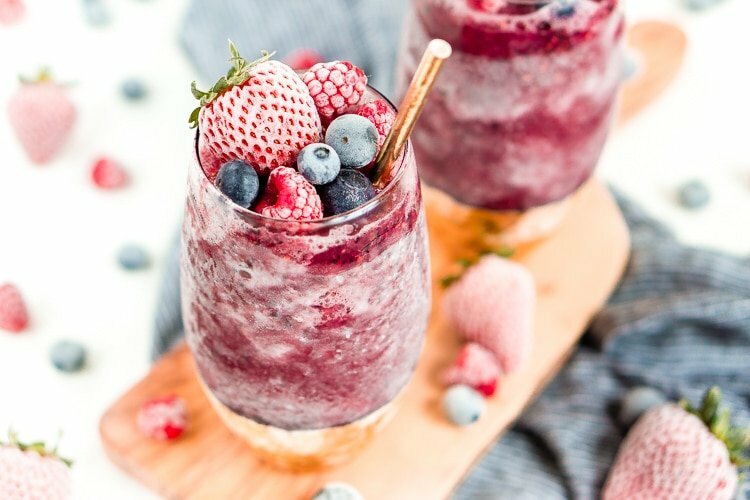 I love the way the blueberries, strawberries, raspberries, and orange come together with the delicious Red Moscato and raspberry and orange liqueurs. 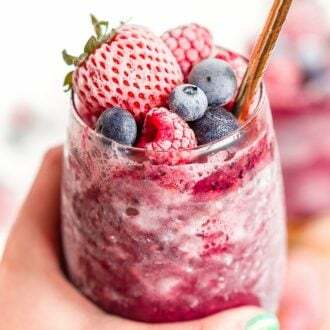 Even though this recipe has a natural sweetness from the berries and is made with a sweet wine, I like to add a touch of simple syrup to soften the wine a bit. If you don’t feel like making the simple syrup at home and you forgot to buy some at the store, you can use powdered sugar instead, but I would add 3 tablespoons instead of 2. This cocktail is so easy to make too, you just throw all the ingredients in a blender and then pour it into a 9×13-inch pan and put in the freezer for at least 2 hours to slush up! And make sure to serve it with a wide straw since it is a bit thick, you could also use a spoon. 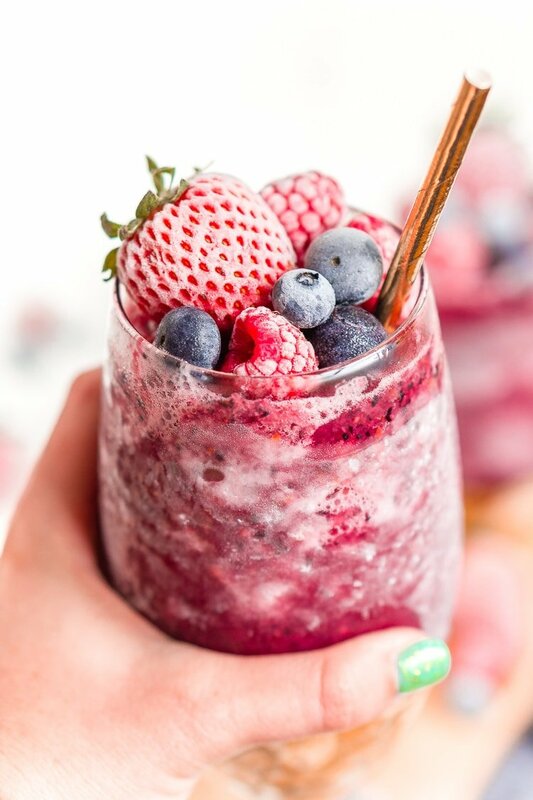 Pin this Slushie Recipe for Later! Add all ingredients to a blender and pulse until blended. Pour the sangria into a 9x13-inch pan and place in the freezer for 2 hours. Break up semi-frozen drink into a slushie and serve with a straw. I noticed that ice was added in the video, but the recipe doesn’t mention ice. How much ice do you add? Hi Kitty, the final recipe was retested and the ice was omitted, but the recipe was shot with ice. It doesn’t make a difference in the recipe.